Can we eliminate an IT or security problem before it occurs or at least resolve the incident in minutes, not days? Has our data been tampered with or modified; if so, who did or tried to do what and when? Are we currently compliant with business and regulatory mandates? Are corporate policies being properly enforced and can adherence be readily proven? Are applications and networks performing at the optimum level and, if not, what needs to be improved? Do we have the visibility and control of our data in virtual and cloud networks? Is there a correlation between customer buying patterns and our IT network performance? The answers to these questions are not always easily accessible. 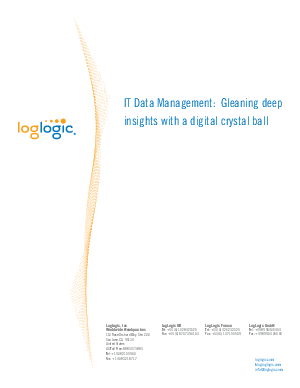 As a result, companies continue their quest to gain this insight, much like seeking a "crystal ball" to glean a deep understanding of what's happening across their IT infrastructure. Seeking the right crystal ball usually comes at a high cost, both in money spent and valuable time lost. Read this whitepaper to learn critical data management insights to help you enable better processes and more cost effective, efficient solutions.